I have the best dinner for you today. It’s quick, easy, full of summer flavors, healthy…ish and yet still kind of cozy too!! You know how much I love a cozy meal! My current state of mind is all about super simple meals. I’ve been trying my hardest to come up with EASY meals for you guys, and let me tell you, it’s not easy in the least. 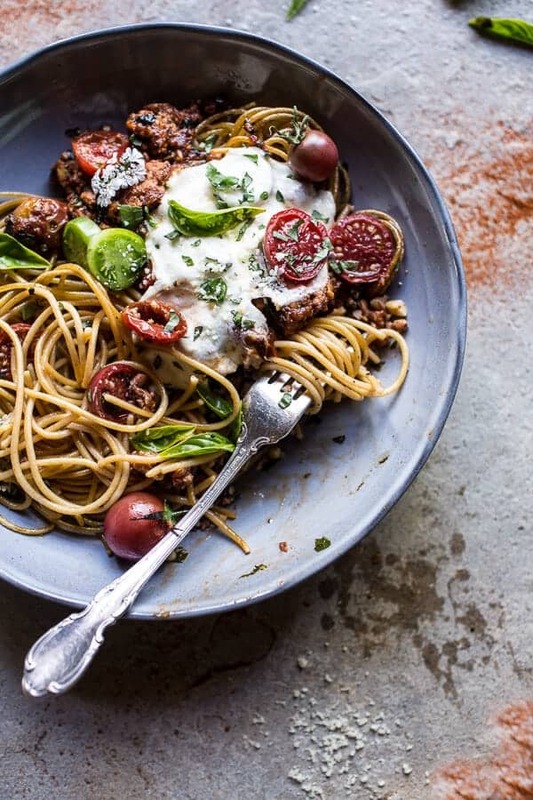 But today’s recipe is a real winner and anyone who loves real chicken parmesan will love this 20 minute heirloom tomato chicken parmesan bolognese. I even think this a dish you will be able to get picky eaters to eat. YESS. Seriously, this recipe is here to save your Monday. And by that, I just mean it will make your Monday extra easy and delicious. If you’re looking for a quick and simple recipe, have people coming over, or just want to feed your family at a decent hour (we don’t even know what a decent hour is around here) and have not a thing planned. Yupp, then this will save your day. Also, I know it may be like a gazillion and one degrees outside where you are, so I am very happy to inform you that you don’t even need to turn on your oven for this recipe. Err, well, if you want to quickly melt that mozzarella under the broiler than you do, but that takes maybe a minute. Clearly we do not need to count that as REAL oven time. So here’s the deal. 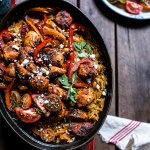 This is one of the quickest cooking and easiest meals around. The hardest part is chopping the tomatoes, and if that’s too hard for you, you can always throw the tomatoes into the food processor OR even just swap in a can of roasted tomatoes (but only if you are in a BIG pinch, cause, it’s tomato season and you have to use them while you have em!!). Once you have the tomatoes chopped up, literally everything goes in a skillet for ten minutes. Then just boil some pasta, add some cheese, melt the cheese a little and that’s it. It really does not get easier and the flavors are SPOT on. 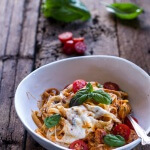 Tomatoes, basil, chicken, parmesan, mozzarella…more basil. PASTA!! 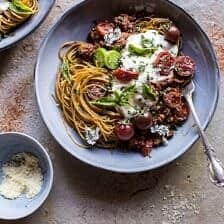 I used heirloom tomatoes for this recipe, but feel free to use any tomato variety, I am mildly obsessed with heirlooms at the moment and pretty much just cannot get over their gorgeousness. Literally, they make me excited to get up cook, shoot and eat everyday. And you know? I think I have yet to see the best tomatoes that summer has to offer. Late August through September seems to always have the BEST heirlooms. Ok and I’m also a tad excited for fall since I have way too many fall recipes floating around in my head, but don’t worry, August is about all things summer. Promise. But umm, has anyone started making football food yet?? My older brother and my younger brother went to the first Browns pre-game of the season Thursday, so that got me thinking about football food. First though, this pasta. It NEEDS to be made. Whoa, I didn’t know I could do that. Cool! 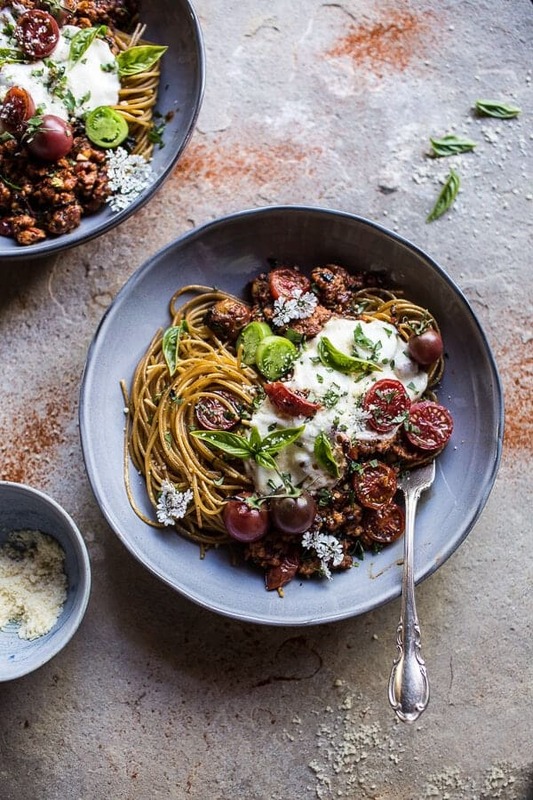 20 Minute Heirloom Tomato Basil Chicken Parmesan BologneseWEB from Half Baked Harvest on Vimeo. 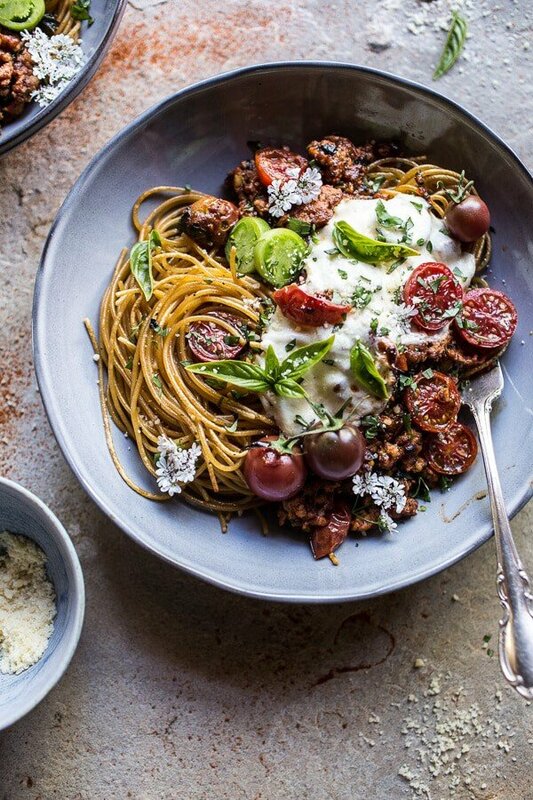 20 Minute Heirloom Tomato Basil Chicken Parmesan Bolognese. It's quick, easy, full of summer flavors, healthy...ish and yet still kind of cozy too!! You know how much I love a cozy meal! Add 2 tablespoons of olive oil to a large skillet set over medium heat. Add the ground chicken and brown all over, breaking up the chicken as it cooks. Add the garlic and cook 1 minute. 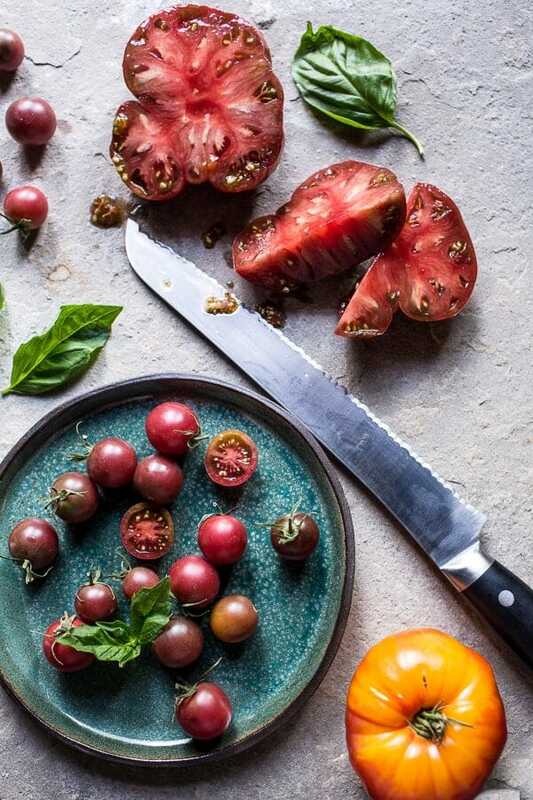 Add both the cherry and regular tomatoes, plus any juice left on the cutting board (if you prefer, you can chop the large tomato in a food processor for fast prep) to the skillet. Cook another minute and then add the remaining 1/4 cup olive oil, red wine, balsamic vinegar and 1/2 cup of water. Bring the sauce to a simmer and cook 10 minutes or until the sauce has thickened just slightly. Season to taste with salt, pepper and crushed red pepper. Meanwhile, bring a large pot of salted water to a boil and boil the pasta until al dente. Drain. Pre heat the broiler to high. Remove the bolognese from the heat and stir in the basil + parmesan. Add the pasta to oven safe bowls (if you do not have oven safe bowls, just transfer the pasta to an oven safe skillet instead) and spoon the bolognese over the pasta. Add the mozzarella and place under the broiler for 30 seconds to 1 minute. WATCH CLOSE, this goes quick! *If you do not have fresh tomatoes on hand, substitute 2 cups of your favorite tomato/marninara sauce or 1 (14 ounce) can diced tomatoes. Kind of pretty too, don’t ya think?!? But really, let’s eat. That pasta is looking GOOD. 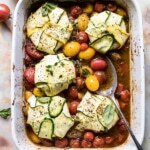 This is a perfect chicken parm for the summer….I have so many tomatoes that I welcome any recipes that I can use them in. 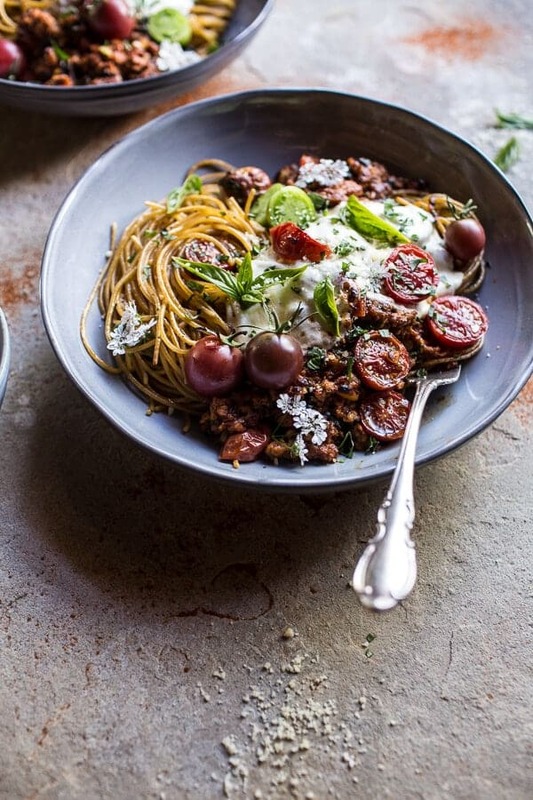 I love this – it is totally late summer in a bowl! 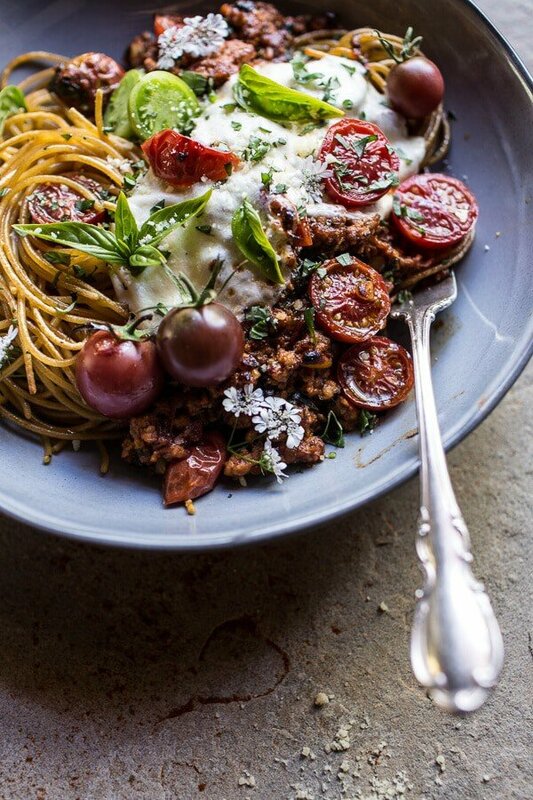 This looks divine and I am a huge heirloom tomato kinda girl. Can’t wait to try this Tieghan! Delicious and easy to make, my kind of meal. The sauce is perfect for tomatoes that are passed their prime . This is perfection. I could’t want anything more from a meal…except ice cream. I don’t tend to associate your blog with easy meals (which is a good thing in my book) but I look forward to seeing what you come up with in the easy category. I have all of the ingredients but for the chicken. I’ll be making a run to the store and having this for dinner tonight! It looks amazing! When do you put in the additional 1/4 c. of olive oil? Sorry Maddy! I fixed the recipe. Hope you love this!! Eek! This definitely gets me excited for fall, except it’s like summer + fall in one pretty package. Love that it can transition into the coming months! How gorgeous is this?! It’s funny how exciting fall can be even when you’re sad to see summer go. I suppose every season has something massively fun woven through it, so we always look forward to the next one near the end of the last. Like pumpkin and apples! And of course, pasta. This is the perfect end-of-summer, beginning-of-fall meal. Can’t wait to give this a try! Thank you so much, Madeline!! 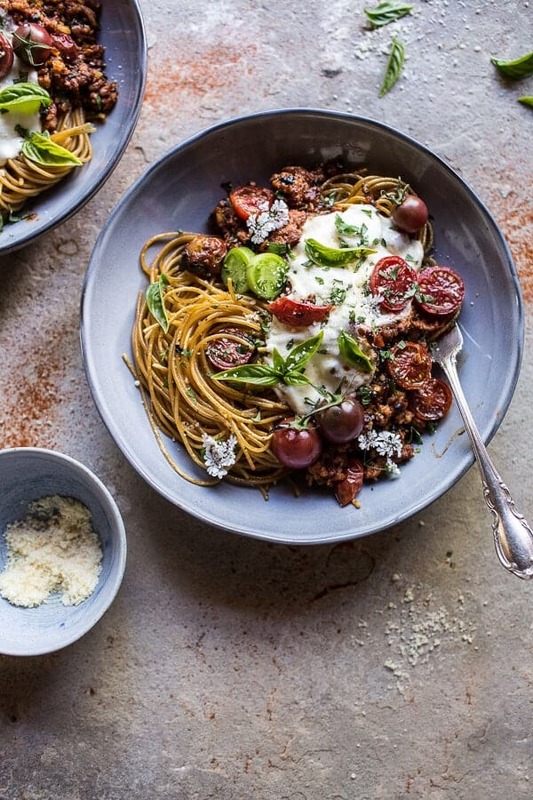 Great pasta dish–it looks beautiful! I think I will make this tonight! I think I’ll find a way to sneak some zucchini is as well. Thanks!! This looks so good and I love my pasta. Mmm this looks like exactly what I want for dinner tonight, and I have heirlooms on the counter waiting to be used. Trying this! Yes please! 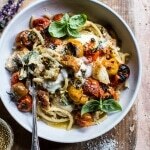 You can never go wrong with pasta for comfort but I love the mix of heirloom tomatoes to give this a summery feel. This was so freaking good! It was insanely easy and so flavorful. I was shocked there weren’t any seasonings, but in the end, the flavor was powerful and pure. So delicious. 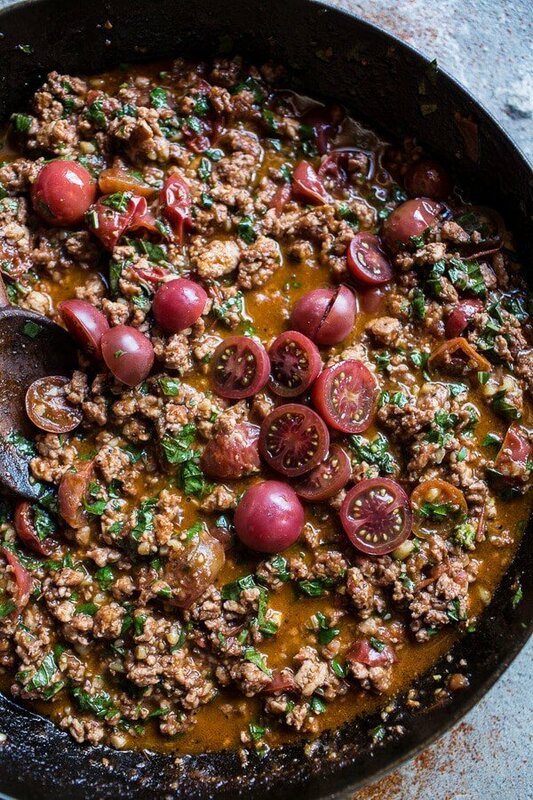 The ground chicken is great in this – better than ground beef would have been. SO happy you loved this! Thanks Megan!! When do you add extra 1/4 cup of oil? Sorry about that. I fixed the recipe, so it is all good to go now. Thanks and enjoy the pasta! Love this – made it tonight! I love all your recipes but most are just not practical to make when I get home from an 8-10 hour workday and still have to do coursework for two classes. This was on the table in 30 minutes and used up heirloom tomatoes and basil from my CSA this week. Would LOVE to see more things like this, interspersed with your over-the-top classics of course! YES!!! I am SO excited you loved this and it worked out for you!! And I am trying…it is a little difficult! LOL! Chicken parmesan is up there in my favorite comfort foods and is definitely my favorite Italian dish. 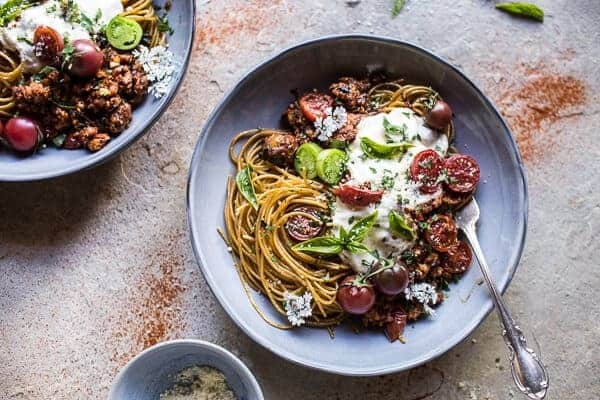 I love the fact that there are heirloom tomatoes in this recipe and it’s only 20 minutes!! This looks AMAZING. I love heirloom tomatoes!! When I make Bolognese I normally use ground beef, but using chicken to make it taste like chicken parmesan sounds delicious! Great idea! I mean seriously, these PHOTOS!!!!! They are all stunners, I want to print them out poster-size and hang them up in my room (but then I’d be hungry all the time so maybe not a good idea) but I love this pasta idea, pinning and making. (: Thank you Britt! I’m so happy you liked it! I will jet to the supermarket tonight and purchase either the ground turkey or ground chicken. I double click on your early a.m. recipes and smile (and that is before I have coffee(~! Haha! How nice!! Thank you I hope you love the chicken parmesan!! Hi! I saw this in its video form and Facebook and was excited to come find the recipe! I was happy to see that the video version was still accompanied by your usual, lovely post and mouth-watering photos! Every week I cull your site for my family’s dinners and then import the recipes into my beloved Paprika app. I love that your site works with the app because some don’t! Anyway, thanks for the inspiration, as always! Thank you for the great recipe! I look forward to making this. And your pictures are so beautiful! Just stunning. Thank you Karolina! Let me know how you like it! I recently made this again and really loved it. So tasty and I love pasta anyway. This recipe was BEYOND good. I made it for dinner last night. It was a hit! We have now decided that this is our go to spaghetti dinner recipe. The sauce is scrumptious. I will never buy jarred sauce again.